Steve Tilston | The Goose Is Out! We have admired Steve Tilston for some time as a singer and songwriter – his song “Roving on a Winter’s Night” is a favourite – so we were delighted to finally be welcoming him to the Goose! Celebrating 40 years as a professional musician! Ask anyone on the English acoustic scene who their favourite guitarist, singer, songwriter and entertainer is and nine times out of ten the same name will crop up in the top three of every department. Steve Tilston is one of our most celebrated song-smiths; widely recognised within the world of folk and contemporary music: the words, arrangements and subtle, quite superb guitar playing could be no one else. The writer of the classic songs The Slipjigs and Reels, Here’s to Tom Paine and The Naked Highwayman, has turned author. Steve has recently published his first novel – full of colourful characters All for Poor Jack is an historical tale set in Bristol and the “New World”. “The longest song I’ve ever written!” says Steve. 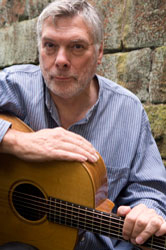 In 2007 Steve was given the boxed-set treatment by Free Reed, the company behind the Richard Thompson anthology; Reaching Back: the Life and Music of Steve Tilston features classic, rare, previously unreleased and new recordings and is a timely celebration of an eventful career; comprising five CDs including tracks contributed by fellow musicians and admirers. In 2009 his early career was hi-lighted in a book Bristol Folk, the story of Bristol’s powerhouse folk & blues scene in the 1960s and 70s. Born in Liverpool and raised in the Midlands, Steve made his recording debut in 1971 with the classic An Acoustic Confusion and has been turning out quality albums ever since. Life by Misadventure, And So It Goes, Solo Rubato and Such and Such all featuring first-class song-writing, quintessentially English in style and typically Tilston, marking him out as one of this country’s finest writers. The instrumental Swans at Coole is testament to his guitar virtuosity. Though known as a songwriter, Steve has always had an ear for the tradition and included new interpretations of old favourites on his original recordings. Of Many Hands is his first “all-traditional” album paying homage to his roots, with unique arrangements of timeless classics. He’s also released a “best of” anthology, The Greening Wind and a live album Live Hemistry recorded on tour with Fairport Convention. On his 2008 album Ziggurat he deftly weaves his mastery on original songs of love, loss, war and gold, plus a couple of traditional gems, as only he can. His latest album is The Reckoning. Steve joined an illustrious band of guitarists including Martin Simpson, Michael Messer and Wizz Jones when he was invited to contribute to the Guitar Maestro series of DVDs; a combination of live studio performance and interviews, revealing the real passion behind these talented musicians…If anyone ever deserved the moniker Guitar Maestro, it’s Steve Tilston! He’s toured with John Renbourn’s Ship of Fools, in a stunning partnership with traditional singer Maggie Boyle (producing the classic recordings Of Moor and Mesa and All Under the Sun), as guitarist with Ballet Rambert, with Maartin Allcock and Pete Zorn in WAZ! with Brooks Williams in A Transatlantic Song-Swap and with his daughter Martha, in the charming “like father, like daughter…” show. Current collaborations see him teaming up with Yorkshire alt-country band The Durbervilles and a new trio with Keith Warmington and Stuart Gordon. A celebrated artist in Britain and abroad, winning accolades in Europe, Australia and the USA, his songs have been recorded by Fairport Convention, Dolores Keane, The House Band, Peter Bellamy, North Cregg, Bob Fox and John Wright. Here’s to Tom Paine is the adopted theme song for the Tom Paine Society of America and, it’s been rumoured, has featured in Bruce Springsteen’s live set. Steve’s music has also featured regularly on radio and TV. Click here to find out more about Steve Tilston!